Great news for book lovers or bookholics out there. Specially, for Nepali book lovers. Today, I will be reviewing about first Nepali ebook reader i.e We Read (BETA). The online payment gateway for buying the ebooks from weRead store are: eSewa and PayBill. I must say this app is in beta version which means you must have patience for more features to be built in upcoming days. The defects or bugs that I found while using this app was that it is not smooth while changing the pages. The developer must do some hard work for User Interface (UI). 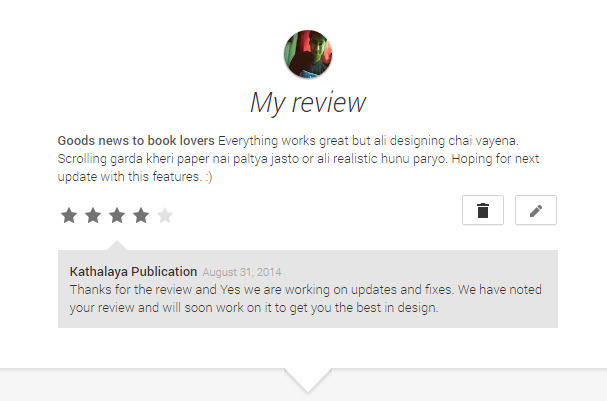 I am glad that they replied to my review and got positive response from them which is appreciable.